Trauma has been reported to contribute to the development of aphthous ulcer, but uncomplicated forceps extraction as a form of trauma has not been reported. This article reports a case of aphthous ulcer in an otherwise healthy 30-year-old female 2 days after forceps extraction of the upper right 3rd molar. The ulcer was painful and disturbed patient mastication. There was associated dysphagia and hypersalivation. Warm saline mouthwash, topical application of Bonjela cream (choline salicylate and cetalkonium chloride), and tablets of prednisolone (5 mg) were prescribed for the patient for 1 week while the patient continued the other postoperative medications. One-week review of the patient showed significant improvement in the clinical presentation. In conclusion, aphthous ulcer may be considered a potential complication of forceps extraction after excluding other contributing factors. The authors hereby recommend (1) ensuring adequate precaution geared toward minimizing trauma to the oral mucosa during forceps extraction and (2) inclusion of aphthous ulcer as a complication of forceps extraction to reduce chances of possible litigation. Aphthous ulcer, also known as a canker sore, is of unknown etiology that usually affects the keratinized or nonkeratinized oral mucosa. It is one of the most common clinically obvious oral ulcerations and is among the oral mucosal conditions that dentists and physicians see most commonly in their patients. Aphthous ulcer in all its forms (minor, major, and herpetiform) presents as painful lesions which appear without reason, last for several days or weeks, heal, and then after a variable interval recur. The cause of aphthous ulcer is unknown, but it is thought to be due to manifestation of autoimmunity to a component of the oral mucosa, local trauma, hormonal changes, stress, iron deficiency anemia, or nutritional deficiency such as folic acid and Vitamin B12.,, Aphthous ulcer has been reported to be a common cause of dysphagia,, daily activity disturbances, and emotional distress with resultant impairment in the quality of life. Treatment for all aphthous ulceration is symptomatic and usually depends on the ulcer frequency and severity. In some cases, treatment may be unnecessary, but where painful topical anesthetics such as Bonjela, antimicrobial, or corticosteroid preparation such as 0. 1% triamcinolone may be beneficial., Systemic corticosteroids may be necessary in severe cases, especially in cases where there are no underlying nutritional or endocrine disorders. 0.2% chlorhexidine mouthwash may be useful in patients who may have difficulty in keeping the mouth clean.,, Literature review did not reveal any report of aphthous ulcer following uncomplicated forceps extraction of a single tooth in patients. This article hereby reports a case of aphthous ulcer as a possible complication or coincidental event after forceps extraction of a single tooth. A 30-year-old businesswoman presented with a 6-day history of a throbbing pain from the upper right 3rd molar which disturbs the patient sleep and mastication. The pain was spontaneous in onset and associated with headache. There was a history of relief of pain by the drug aspirin. She is married with 2 children in a monogamous setting. A history of surgery (appendectomy) was uneventful. Clinical examination revealed carious upper right 3rd molar which was tender to percussion. Periapical radiography revealed disto-occlusal radiolucency communicating with the pulp of the tooth. Forceps extraction of the tooth was carried out by an intern under the supervision of the consultant. 400 mg of metronidazole, 500 mg of amoxicillin, 1000 mg paracetamol, as well as warm saline mouthwash were prescribed. The patient was given a 1-week appointment for review. The patient reported to the clinic, 2 days after extraction, with a complaint of severe pain which disturbed his chewing of foods. The patient also complained of difficulty in swallowing (dysphagia) and hypersalivation. The patient said that she was experiencing her menstrual flow at that point in time. Clinical examination revealed that a small, round ulcer measuring 12 mm with yellowish floor was found on the palate close to the extraction site. The ulcer was well circumscribed and the margins of the ulcer were reddish (erythematous). The features of the ulcer were consistent with the diagnosis of major aphthous ulcer [Figure 1]. Warm saline mouthwash, topical application of Bonjela cream (choline salicylate and cetalkonium chloride), and tablets of prednisolone (5 mg) for 1 week were prescribed for the patient while the patient continued with her other postoperative medication. She was given another 1-week appointment for review. On recall appointment, the aphthous ulcer has resolved. Aphthous ulcer is thought to occur due to a manifestation of autoimmunity to a component of the oral mucosa unknown. Several factors have also been shown to predispose an individual to the occurrence of aphthous ulcer. The authors have reported aphthous ulcer following physical trauma. Extraction using forceps and elevators, along with the digital manipulation of the oral tissues, puts pressure on the palatal mucosa while extracting the upper third molars. This pressure can cause microtrauma that may or may not be predisposing factor for aphthous ulcer. We hypothesize that during the procedure, the pressure exerted on the palate by the operator's digits and instruments may have caused injury unknown to the dentist and imperceptible to the patient, thus triggering the manifestation of the ulcer. Iatrogenic trauma, which is more common in treatment rendered by young practitioners, has been implicated as a predisposing factor for aphthous ulcer., In this reported case, the operator was a house officer. Although investigators have not fully elucidated the predisposing factors for aphthous ulcer, several factors have been identified: microtrauma, hormonal changes as seen in menstrual cycle, immunosuppression, dental procedures, local trauma, physical and emotional stress, iron deficiency anemia, and nutritional deficiencies such as folic acid and Vitamin B12. The patient in this reported case was in her menstrual flow and menstruation is commonly associated with hormonal changes and could also be a cause of great physical and emotional stress for the patient. Hormonal changes and stress are established predisposing factors for aphthous ulcer.,, When considering aphthous ulcer after dental procedure in a female patient, it is therefore important to exclude hormonal changes during history taking. 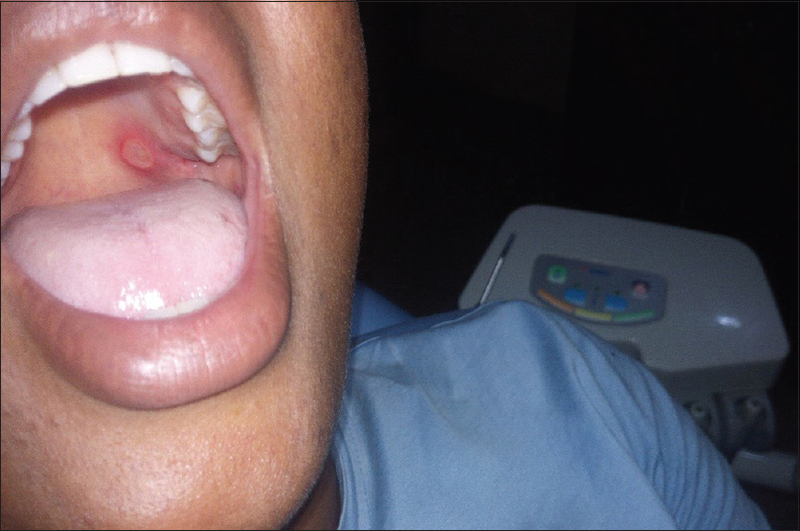 The diagnosis in this report was based strictly on the history and clinical finding of the oral ulcer and no further investigation was done, which may be an obvious limitation. Inclusion of aphthous ulcer as a complication of forceps extraction to reduce the chances of possible litigation. Scully C, Felix DH. Oral medicine – Update for the dental practitioner. Aphthous and other common ulcers. Br Dent J 2005;199:259-64. Elley BM, Soory M, Manson JD. Periodontics. 6th ed. Philadephia: Elsevier Limited; 2010. p. 367-75. Scully C. Oral and Maxillofacial Medicine: The Basis of Diagnosis and Treatment. 3rd ed. Edinburgh: Churchill Livingstone; 2013. p. 226-34. Nevile BW, Damm DD, Allen CM, Bouquot JE. Oral and Maxillofacial Pathology. 3rd ed. Philadephia: WB Sanders; 2008. p. 331-6. Preeti L, Magesh K, Rajkumar K, Karthik R. Recurrent aphthous stomatitis. J Oral Maxillofac Pathol 2011;15:252-6. Trieste JM, Bruch NS. Clinical Oral Medicine and Pathology. New York: Humana Press; 2008. p. 53-6. Patil S, Reddy SN, Maheshwari S, Khandelwal S, Shruthi D, Doni B, et al. Prevalence of recurrent aphthous ulceration in the Indian population. J Clin Exp Dent 2014;6:e36-40. Shulman JD, Beach MM, Rivera-Hidalgo F. The prevalence of oral mucosal lesions in U.S. Adults: Data from the third national health and nutrition examination survey, 1988-1994. J Am Dent Assoc 2004;135:1279-86. Davatchi F, Tehrani-Banihashemi A, Jamshidi AR, Chams-Davatchi C, Gholami J, Moradi M, et al. The prevalence of oral aphthosis in a normal population in Iran: A WHO-ILAR COPCORD study. Arch Iran Med 2008;11:207-9. Safadi RA. Prevalence of recurrent aphthous ulceration in Jordanian dental patients. BMC Oral Health 2009;9:31. Abdullah MJ. Prevalence of recurrent aphthous ulceration experience in patients attending Piramird dental speciality in Sulaimani city. J Clin Exp Dent 2013;5:e89-94. Omoregie OF, Okoh M, Oral ulcerative lesions: A review of 55 cases in Benin City, Nigeria. Niger Dent J 2013;2:4-7. Porter SR, Scully C, Pedersen A. Recurrent aphthous stomatitis. Crit Rev Oral Biol Med 1998;9:306-21. Clark D. How do I manage a patient with aphthous ulcers?. J Can Dent Assoc 2013;79:d48. Tarakji B, Gazal G, Al-Maweri SA, Azzeghaiby SN, Alaizari N. Guideline for the diagnosis and treatment of recurrent aphthous stomatitis for dental practitioners. J Int Oral Health 2015;7:74-80.